My most favorite liqueur is Kahlua. Did you know they claim it takes seven years to make a bottle of this Mexican liqueur? Aged to perfection I’d say. 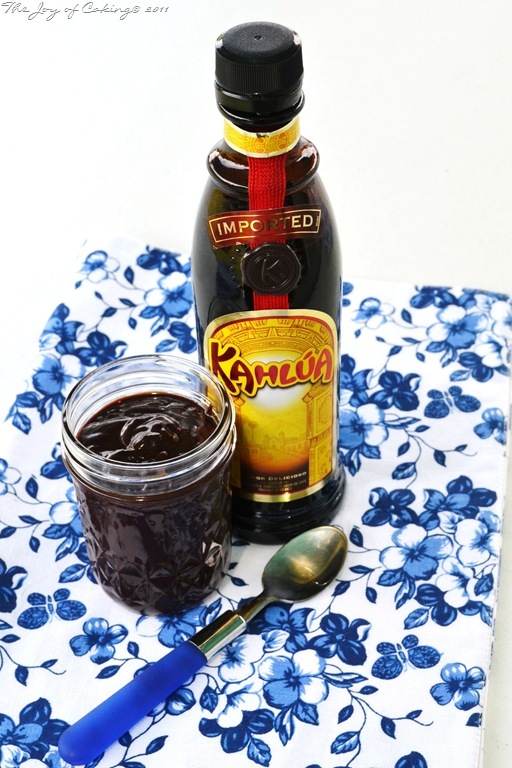 I love using Kahlua when I make some of my sweet confections. It’s rum base, coffee flavor, and slight hint of vanilla makes it the King in my book. I have a recipe for an awesome Kahlua cake, a Kahlua mousse recipe that will knock your socks off, and over the weekend I had my first taste of Kahlua fudge – oh, my dear Lord! But just when I thought it could get any better; I crafted one more Kahlua recipe to add to my trusty recipe box. Here are two key ingredients you will need. Here’s another hint. It goes best on vanilla ice cream. 1 tbsp. sugar, plus 1 tsp. 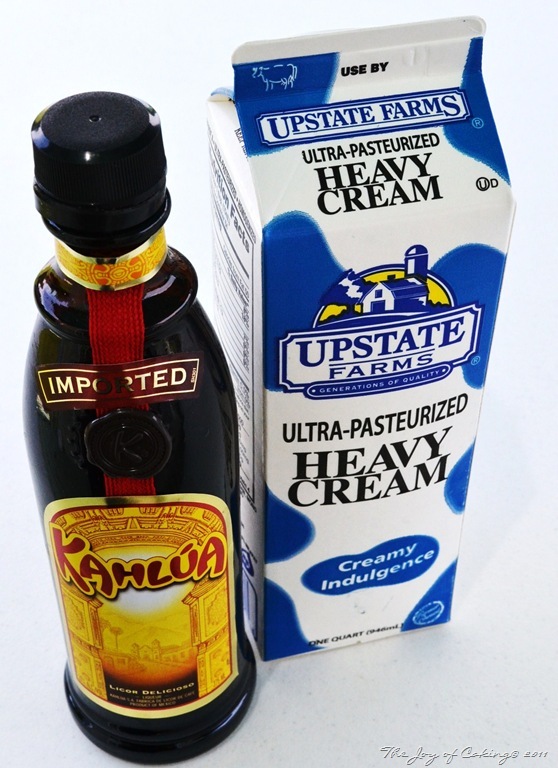 Place all ingredients (except Kahlua) in double boiler. Melt on low heat until sugar is dissolved and texture is smooth and creamy. Add Kahlua; mix thoroughly. Serve while warm, or keep in refrigerator until needed. Re-warm in microwave when ready to use. Makes one pint. 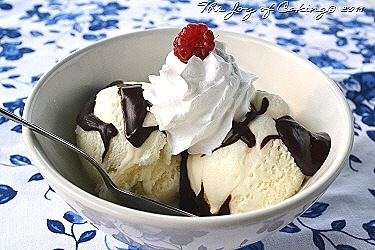 This hot fudge is so simple to make. And it is for certain, the most delicious hot fudge I’ve ever had, especially on homemade vanilla ice cream (pictured below). What a fantastic idea for a hot fudge sauce. I’m in lust. I love this stuff too! I had a friend that made homemade Kahlua! It just wasn’t the same as the real thing. Perhaps his didn’t age and that may be what makes the difference. Why wait that long when you can buy the real thing anyway? This sauce sounds divine! Reblogged this on THE JOY OF CAKING. This is just plain ol sinful and I may have to ask for forgiveness when I eat way more than I should. I have a corner left in my bottle of Kahlua and now I have a good excuse to buy more. Oh wow! Now that is a dessert topping I could go for! Ooooh, yeah! Now that’s what I call a fudge sauce! Love Kahlua and I can just imagine hoe gooooood this fudge sauce is. Love anything boozy. Mmmm-kahlua fudge, now that is a nice way to top vanilla ice cream! Thanks for sharing. Yes, ma’am. I love kahlua too. I made kahlua brownies last year and they were so good! I’m wishing I had a bowl of this right now. SO good. Thanks for sharing sweet thing!